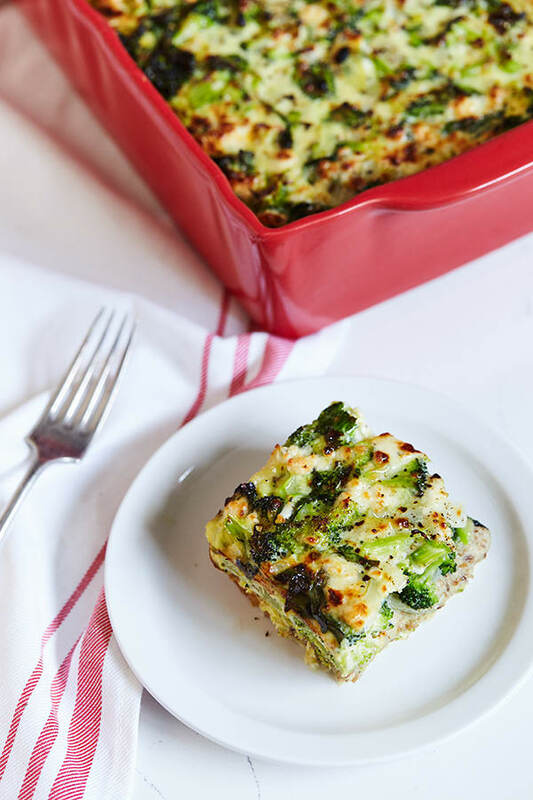 If you’re looking for an easy way to make a healthy brunch for the family or yourself, this Spinach and Broccoli Strata is a perfect dish to make the night before and serve the next day without any hassle or mess. This dish is perfect because you can prepare it the night before and not worry about getting up early to start breakfast when it’s already done and waiting for you. Boil water in steamer or large saucepan over high heat. Reduce heat to medium-high. Place broccoli in steamer basket; cook for 3 to 4 minutes, or until tender-crisp and bright green. Place in ice water bath to stop cooking process. Drain and coarsely chop. Set aside. Add garlic; cook, stirring frequently, for 1 minute. Remove from heat. Set aside. Combine eggs, milk, spinach, salt, pepper, broccoli, and onion mixture in a large bowl; mix well. Place bread and cheese in 3-quart baking dish that has been lightly coated with spray. Top with egg mixture. Press down gently so that bread absorbs egg mixture. Cover with aluminum foil. Bake for 20 minutes. Remove foil; bake for an additional 15 to 25 minutes, or until strata has puffed up, is cooked through, and is lightly browned on top. Tip: Strata can be covered and refrigerated overnight before baking. (This may increase baking time.) This works well if you are serving it for brunch. Next articleWhich Whey is best for you?